In 1777, British explorer and navigator Captain James Cook brought a linguistic discovery back to England. The word taboo, Cook wrote in A Voyage to the Pacific Ocean, encompassed an array of forbidden acts and behaviors in Tonga, a Polynesian archipelago. 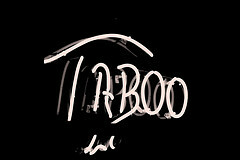 From the Proto-Polynesian word ta, meaning “mark” and bu, meaning “especially” comes the compound-word tabu. Various forms of this word exist on several Pacific islands: kapu in Hawaii and tapu in Tahiti.